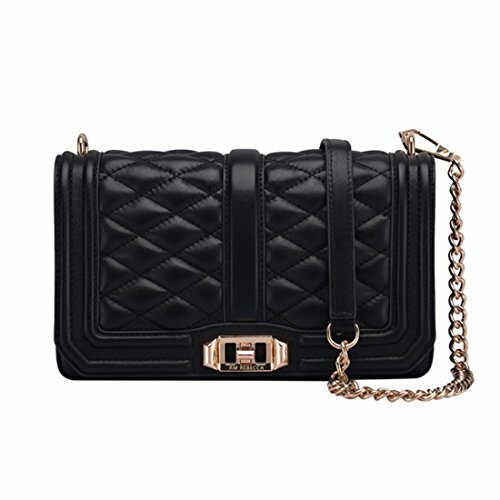 A structured cross-body bag styled in quilted leather. A slim pocket trims the back, and a polished turn lock opens the front. Cotton inside lined, interior zip，adjustable shoulder strap. MATERIALS - 100% cowhide. Rotate locks, easy to open and close, while increasing internal safety. Soft and delicate leather to reduce wear and tear. Charming and classic Lingge chain pack! CLASSIC EXTERNAL - Quilting design, fashion look. With a long shoulder chain strap, you will feel comfrotable when putting it on your shoulder or cross your body. INTERIOR FEATURES :1 main compartment, 3 card slots and 1 outer pockets.conveniently placed mobile phone ,keys, wallet, sunglasses and other objects; has enough space for everyday things. BENEFITS - this fashion crossbody bag goes well with any outfit in any occasion like party, wedding and dating, classic accessory for your evening ensemble. classic and fabulous looking bag goes well with any clothes. You deserve to have! If you have any questions about this product by zhanxianpiju, contact us by completing and submitting the form below. If you are looking for a specif part number, please include it with your message. SanMario Designer Handbag Top Handle Padlock Women's Leather Bag Crocodile's Skin Patterns Embossed with Golden Hardware Black 35cm/14"